Arguably, prior to the new JJ Abrams Trek, WOK was one of the few genuinely decent Trek flicks (I’d also add “First Contact”). 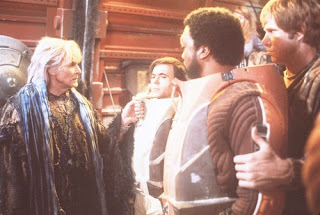 Bringing back one of the great baddies from the Original Series, Khan Noonien Singh, gave the franchise the shot of nasty adrenaline missing from “Star Trek: The Motion Picture”. TMP was an interesting experiment in reviving an old property. You have to remember, before Trek, there was no precedent for bringing a old TV series to the big screen. The first movie was like the creative team learning to walk again, it was so consumed with awe-inspiring spectacle, it took the second film to get to the action the series deserved. Nicholas Meyer, then a newbie to directing, but renowned writer ("The Seven Percent Solution") directs the film with the inspiration of a sea-faring adventure, a dogfight between two ship captains on the high seas, or two u-boat commanders engaged in an intergalactic chess match. To open the film we see the Enterprise crew minus Capt Kirk, engaged in a battle with a Klingon warship. A Vulcan beauty Lt. Saavik (Kirstie Alley) commands the vessel to its destruction, after which we learn its just a training exercise - the famous Kobayaski Maru test, which will be featured in the new Trek. It turns out Kirk has been promoted to Admiral – a desk job really, far from the gritty action he’s used to. While supervising Saavik’s training Kirk and the real crew are called in to investigate a highjacking deep in space. Meanwhile Chekov and his new ship the Reliant have been taken over by one of Kirk’s old nemeses from The Original Series, Khan (Ricardo Montalban), the 20th Century prisoner exiled by Kirk on the TOS episode “Space Seed”. Khan is hungry for revenge (a dish best served cold) and power and he serendipitously finds it in the form of the new planet-making device Project Genesis. It will take all of Kirk’s instincts and cunning to defeat the intellectually superior Khan, but when he finds the situation un-winnable, it's Spock who will make the grand sacrifice for his old friend. The introduction of Khan is a brilliant build-up of suspense - the desolate and decrepit planet leading to Chekov’s discovery of Khan’s belt buckle which reads ‘Botany Bay’ is a great nod to the Treksters who would have remembered the name of Khan’s original ship. And those disgusting beast creatures which are placed in Chekov’s ear gave me nightmares as a kid for weeks. Ricardo Montalban, who then was known by most as Mr. Roarke on “Fantasy Island”, plays heavily against type. And he manages to convert his soothing Mexican voice into that of a menacing maniacal psychopath. He’s by far the best villain the franchise has ever had. James Horner's grand music is masterful. Perhaps the string and horn arrangements steal some from John Williams, but arguably it even soars higher than Jerry Goldsmith's great score from "Star Trek: The Motion Picture". It thus became a rare occurrence to have two equally great music scores produced for one franchise. For music score fans, the special features of the new Blu-Ray disc has a fine featurette with Horner deconstructing his score and his motivations for many of the key scenes. WOK was the first in an unplanned trilogy which links directly to "The Search For Spock" and "The Voyage Home". Unfortunately the other two films didn't achieve the dramatic heights of "Wrath of Khan", and even counting the new flick, I'd say WOK is still top of the Star Trek heap. Enjoy.